Over here in leafy Ealing we're in the throes of a revolution. Big changes are afoot ... and not everyone is totally chuffed about what's in the pipeline. 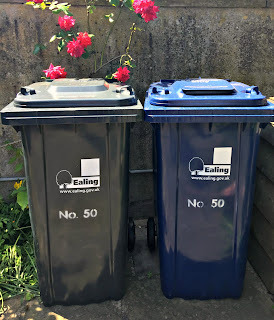 The local council has abandoned the weekly black bin-bag collections, and, having given us all not one - but two - HUGE wheelie bins, is now planning on collecting our rubbish on a fortnightly basis. We'll have recyclables carried off one week and non-recyclables the next. On the school run this morning we came upon this graveyard for our old recycling bins. For a disorganised soul such as myself I can see much confusion ahead. I'm sure I'll struggle to remember what I'm supposed to be getting rid of each rubbish day. The council have helpfully given me a spreadsheet, which Mr B has very helpfully stuck on the door of the fridge, where all the most important announcements that affect our little household get posted. Even in the glorious June sunshine with blues skies and rose blossom they ain't looking all that pretty. 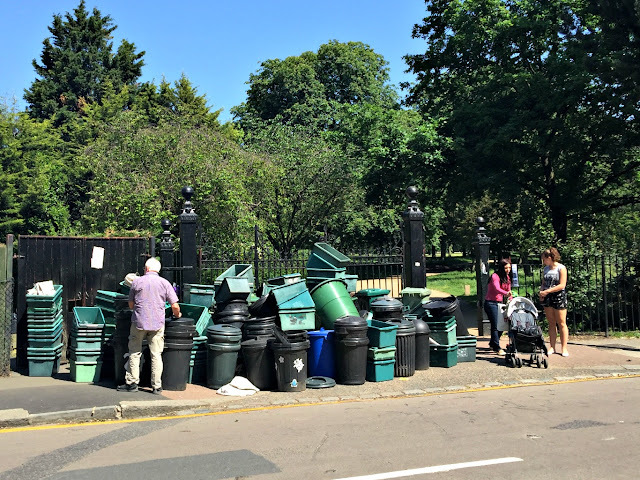 One of my friends, who's a landscape gardener and lives across the Common, hates these wheelie bins with a passion. Most of our front gardens aren't very big, so she believes that the already endangered green spaces facing onto the streets will be blighted by these eyesores (her words), making it even harder to get people to take pride in that precious area out front, and not simply give up and turn it into an off-street carpark. 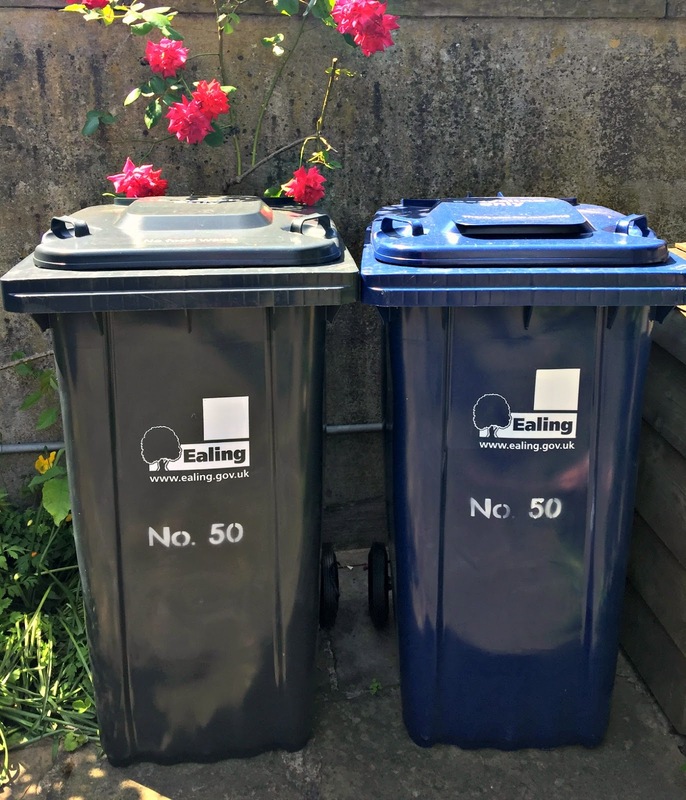 She had a bit of fun the other day at the council's expense by tweeting a revised Ealing logo with the tree that you can see on the bins replaced with a super-sized wheelie bin. 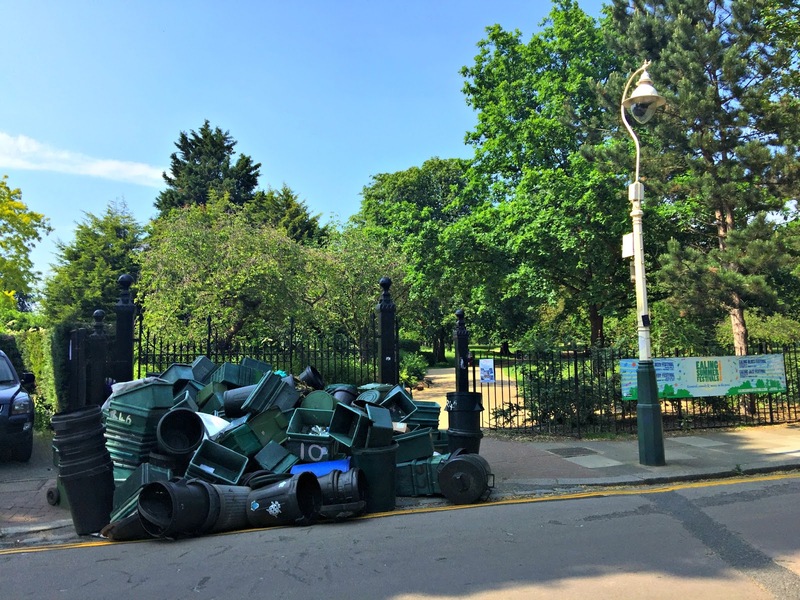 It all blew up into a twitter storm as anxious local business owners tweeted their concern that a new logo with a HUGE rubbish bin might not give the best impression of what we're all about over here in this green and leafy corner of the capital. Eventually some bod down at the council office had to tweet a rebuttal: no, they had not replaced the lovely tree with a wheelie bin on the official Borough of Ealing logo!! So wheelie bins it is! I've seen the future, and it's plastic with a flip-top lid and glides on two back wheels. 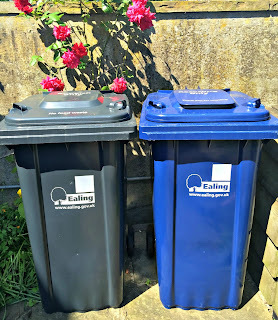 Now this presents another issue: everyone's bin is exactly the same ... so how should I go about personalising mine? Being a deeply original thinker I hit upon the brilliant wheeze of putting my house number on it. Genius! The only thing was that all the stencil kits that I could find online cost several quid and could only be delivered the day after tomorrow, which would be one day late for my first rubbish collection. And with this lovely weather there was no way I was going to waste a minute of sunshine by going shopping. Undaunted I decided to make my own stencil. I went to the most useful photo-fixing site on the web: Picmonkey and using their Design option set about designing my house number. I chose a very simple font so that it wouldn't be too fiddly to cut out, centred it on the page, and made it as large as I could. Satisfied I saved my creation to my laptop and printed it off. Next I got some masking tape and stuck one side of my print-out to a piece of card. Using a not desperately sharp HB pencil, I traced around the letters and numbers so that the force of the pencil left an impression on the card beneath. Then I followed the outline on the card with my pencil to re-create the print-out on the card. I coloured it in cos' it looked prettier (!) and I thought it might make the cutting out part easier. Next I got a small scalpel (a Stanley craft knife), and, leaning on a chopping board, I cut out the letters in the card. Now here's the thing if you just follow the zero and the o all the way round you'll end up with a circular or an oval hole without that dinky centre pick-out. In order to keep the centre in your template you need to make a little bridge, top and bottom, of these figures to keep it in place. I found that when I was working with the knife it was best to always cut towards me, and to turn the card around as I went so that I was always working in a comfortable position. When you're done, you need to stick the card to the surface that you want to paint with masking tape. 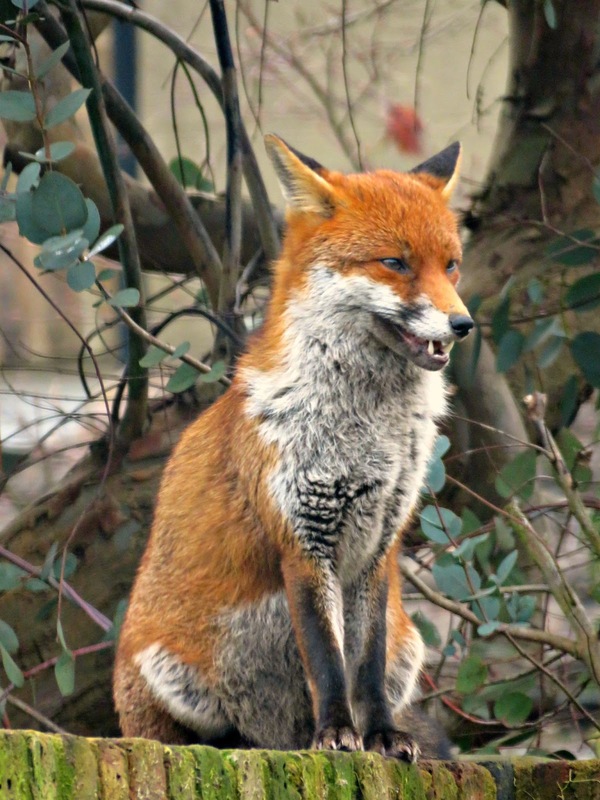 Take care not to allow it to sit proud otherwise it will distort the image. You need to use a suitable can of spray paint that will work with the type of surface you're painting. Shake the can well, and hold it several inches away from the stencil. Don't apply too much paint or there's a risk that it will run down, drip and look messy. Leave the template in place for half an hour or so to let the paint dry a bit, and then remove. You can save the template to use again. It won't go on for ever, but then again there's probably only so many times you want to put your number on your bin. If you have any spills or drips you can always wash them away with some kitchen roll and a bit of white spirit. PS Yes: I've now spotted the white square where I think we were supposed to write our house numbers with an ink marker - duh! We went to the Big Bin system a few years ago and then this past year they started the bi-montly on the recycle only. They still pick up trash every week. Isn't life fun.